For several decades I have immersed myself in the life and legacy of Lilias Trotter. It began with seeking out sites of information about Lilias as well as writings and watercolors by Lilias. The motive, initially, was a personal pilgrimage: a craving to learn more about one whose life and faith and art had touched my heart and mind – from whatever source possible – a considerable feat during the early stages of my journey, without the aid of search engines. The result was the eventual publication of two books: a biography – A Passion for the Impossible and a sketchbook – A Blossom in the Desert (both published by Discovery House). The first publication was about her life – a fairly straightforward account of her life and the influences that shaped her; the latter was a compilation of her work – watercolors and writings culled from her diaries, travel journals, and unpublished or out-of-print works. So. Why blog Lilias? When is enough enough?! Let me give a few reasons for not yet abandoning Lilias. First, there is still much to be culled from her works. 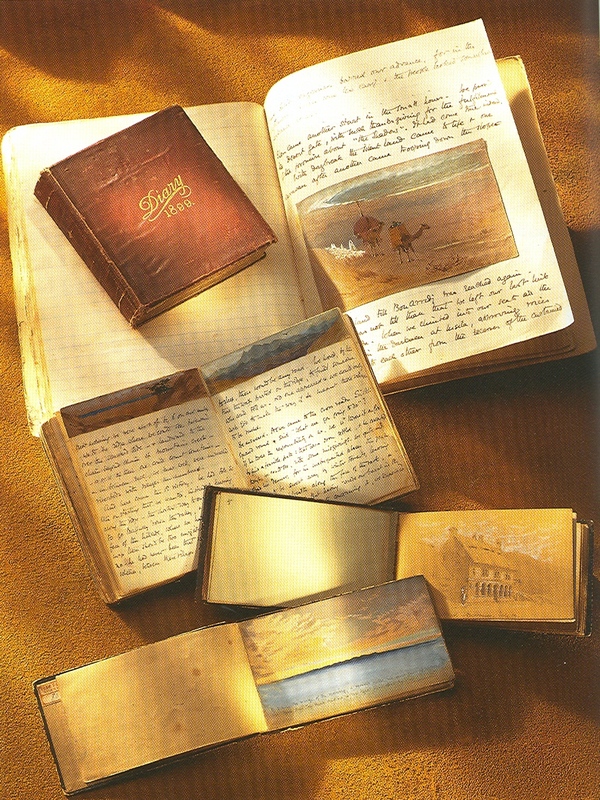 For all the paintings and quotes from her journals and diaries included in the biographical works, there remains much that is yet unpublished: exquisite watercolors, provocative entries from her journal and diaries, story parables in Arabic, French and English – to say nothing of a rich reservoir of English devotional material as well as books for her beloved Arab friends. A blog is a medium to put out material for people who are curious enough to seek it out. Which brings me to my second reason: my books have triggered responses and queries from 3 unique groups of people: artists (or art loving people) who are intrigued by the Ruskin/Trotter relationship or by Lilias’s artistry; individuals who are involved in missions, particularly to the Arab World, who wish to locate her writings about or for the Arab people; others who have, like myself, been touched by her insight, almost mystical in nature, to deeper spiritual realities. This blog is intended to provide that link for more information than can be contained between the covers of 2 books. Thirdly, a continued personal exploration of her art and writings: my reflections on those thoughts and images that have fed my soul today – in the here and now. The individual posts – weekly in intent – will allow me to share with others specific thoughts on how her writings, almost a century past, have relevance today. The enduring resonance of eternal truths. Finally, to offer a constant touch point during the next few years as Arab World Ministries, now a part of Pioneers International, grows in its role of mobilizing for ministry among Muslims of the Arab world. The site of the Trotter Archives is presently at the AWM office in Loughborough, England. These materials, along with the archives of the Southern Morocco Mission, North Africa Missions and Arab World Ministries are presently being prepared for a new and permanent location. This blog will keep track of this transition and provide eventually sites for further research. Entering this world of blogging is, to say the least, an adventure for me. The years of researching and writing the biography led me from typewriter to word processor to computer. I step out of my comfort zone, once again, in attempt to gain a working knowledge of a blog site. Be patient with me – and, I hope – that this site will gain in interest and value as I gain in technical proficiency! 15 Responses to Why Blog Lilias? Dear Miriam, I am so happy to have discovered your blog today through seeing it mentioned on another blogger’s site simply as a “Lilias Trotter” blog. What a joy. Three years ago I read both of your books. Lilias Trotter and her life had a great impact on me; it was like finding a refreshing drink of water. As for the “3 unique groups of people” you mention above I love her art, her particular style of illustration, and art in general, but my most fervent reason for wanting to know as much as possible about Lilias is that I have “been touched by her insight, almost mystical in nature, to deeper spiritual realities” and the way she “reads nature” as you mention on another post. So, thank you for starting this blog. I will certainly be spending time here catching up on a year’s worth of posts and all your tabs. Thank you Miriam about sharing more in detail about Lilia’s Mission and Art. I myself wanted to study art but decided to become a pediatric nurse to follow Jesus into mission in West Africa. Just a few weeks ago, I found out about Lilia Trotter and am in the process of reading “A Passion for the Impossible”. I am teaching spiritual growth to student pastor’s wives at a Bible school in Korhogo, Cote d’Ivoire and am very inspired by the life of Lilia a century ago. Looking forward to explore your blog. Blessings on you. It is wonderful to hear how Lilias ministers to you today. I continue to be amazed at how her legacy – life and works – is relevant to individuals in various walks of life and life stages. As an artist, you would enjoy the compilation of her writings and watercolors: Blossom in the Desert. I hope that you continue to find expression for your artistic gifts, as did Lilis, albeit in a different capacity. I am so happy to find this site. In 1997 someone gave me a copy of the book Until the Day Breaks by Patricia St.John. I was enthralled by Lillias Trotter’s life. Then as soon as it came out, friends gave me a copy of Blossom in the Desert because they knew how much I had gotten from the story of her life. Thank you for all you’ve done to keep her work alive and for reminding all of us that “giving up and one’s gift” to serve God is not really giving up your gift but allowing Him to make that gift more effective (despite the world believing that it’s been wasted). Dear Sister in Christ, I first received your book. Blossom in the Desert from my sister Kim Simmons of Litchfield CT. Oh my heart was stirred,, so that I have passed new copies on to many friends to let them also “see”. Last night I finally watched your documentary. It is a great blessing, so refreshing and inspiring. Thank you for persevering. You have contributed essentially to the giving of Lilias’ gift to generations to come. I am hoping Blossom in the Desert will be reprinted soon. I will pray for a continued and growing interest in her, and your, work to the glory of God. Thank you for your blog and all your work in keeping Lilias legacy alive! I have just discovered Lilias and you this week and I am eager to read your books and do more investigation into Lilias’ art and life! I am an artist and constantly seeking what the Lord would have me do with the gift he has given me. Lilias life is such an inspiration! I am so glad God turned you into a detective!